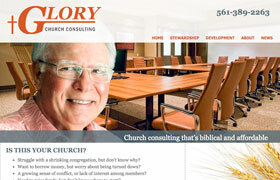 For this Florida-based church consultant we designed a website and content to attract church leaders and pastors seeking help with fundraising, loan preparation, and leadership development that is both biblical and affordable. The project included a logo refresh for the brand, artwork for business cards, and postal mailers. The site is responsive and includes a WordPress blog delivered monthly via RSS feed to permission-based subscribers and ongoing social media on Facebook.